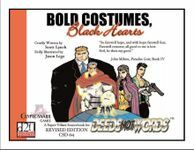 Villains get the royal treatment in Bold Costumes, Black Hearts, which features a total of 85 original and ready-to-use super-villains for all campaign power levels and play styles! This is the largest and most popular Deeds Not Words supplement, newly revised and updated with heaps of additional material. Weighing in at 148 pages, BCBH is chock full of pregenerated villains, villain-related feats, villain quotes, weapons and equipment, new feats, and other crunchy goodness! GMs looking for new threats to spice up their Deeds Not Words campaigns can expect to find 10 archetypal "variable villains" (each presented with five different stat blocks, ranging from a modest Threat Rating of 4 to a whopping Threat Rating of 24), 5 villain teams, 52 solitary villains, the Goonmaker, the Random Ninja Generator, a table of 100 Random Villainous Plots, and more! Face the titanic strength of Bulkington, the superhuman bruiser; outwit the misguided anti-corporate activists of the Zero-Sum Gang; upgrade your anti-virus software to deal with techno-mystic computer hacker Pythagoras; take cover against the full power of the mighty mercenary War Saints; and last but not least keep an eye peeled for the cute but planet-smashing Autonomous Destruction Device 13, plus scores more thieves, assassins, tyrants, miscreants, interlopers, anarchists, gangsters, conquerors, and felons!